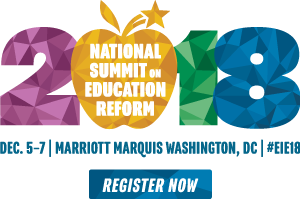 Today, Lizzette Gonzalez Reynolds, ExcelinEd’s VP of Policy, takes a look at the 12 can’t-miss conversations we have planned for the National Summit on Education Reform (#EIE18). Enjoy! What could happen if every state policymaker and leader began 2019 inspired and empowered to build a brighter future for our nation’s families? On December 5-7, Governor Jeb Bush and ExcelinEd will host the 11th annual National Summit on Education Reform in Washington, D.C. I wish every state policymaker and leader in the country could be there, however, there’s still space for you! In addition to exceptional keynote speakers, attendees will get to choose from the following 12 in-depth strategy sessions on quality, innovation and opportunity in education. These can’t-miss conversations will feature policy experts, legislators and educators sharing ways to shape and improve policies on behalf of all students. If you’re excited to build a brighter future for our nation’s students, please join us at #EIE18! What does brain science tell us about how children learn to read? And, what are the implications for early literacy policy? This session addresses the latest science behind learning to read, looking along the entire birth-through-grade-3 continuum. We’ll examine how organizations and state agencies are putting into action key principles to provide a cohesive, seamless approach to early literacy and better ensure grade-level reading by the end of third grade when children transition from learning to read to reading to learn. Research confirms that social emotional development is essential to student success at home, school, the workplace and in life. Schools can play a role in fostering and influencing the development of these important skills, behaviors and attitudes. This session features an overview of the compelling research, the impact of these skills on academics, their importance in the corporate sector/workplace and examples of how state and district policies can integrate social emotional learning and academic development. Schools and districts face mounting demands to provide students a wider range of learning opportunities and deeper, more relevant preparation for college and career. At the same time, many schools struggle to recruit, retain and develop a diverse pool of talented teachers for high-need subject areas. From teacher certification policy to effective professional development, this session examines innovative state-level efforts to overcome barriers and to expand both the teacher pipeline and capacity, with the goal of better preparing all students for future academic attainment and economic success. Policymakers often cite a tension between traditional assessments and the untraditional innovations helping a vast number of students, such as personalized leaning and 21st-century college and career pathways. Is the solution to this tension simply more innovation? This session focuses on the latest advances in student assessment, such as allowing students to “show what they know” with interactive online tasks and taking tests when they’re ready. Also, higher-quality interim assessments can provide teachers with timely insights to help tailor instruction for their students, and advances in reporting empower parents with digital, personalized information on their child’s skills and abilities. Policymakers in every state can agree that we must ensure students have access to rigorous pathways that prepare them for workforce success in a changing economy. Effective Career and Technical Education (CTE) programs play a vital role in establishing and sustaining these 21st-century pathways. Join a panel of national, state, regional and local leaders to discuss specific steps state policymakers can consider to refresh and revitalize CTE programs and ensure they provide a road to student success. Attendees will learn ways to engage stakeholders, expand student access to high-quality career pathways and ensure programs are closely aligned to regional and state industry demands. States are shifting away from funding education inputs and toward funding for outcomes. The shift is more pronounced and developed in higher education. Panelists in this session will highlight lessons learned from performance funding in higher education, explain implications and opportunities for K-12 and discuss how state policymakers can best explore K-12 performance funding in their states. By 2020, 65 percent of the jobs in the nation will require some type of postsecondary credential. As a result, more and more students (and their parents) are seeking to jump-start earning college credentials in high school. Yet given the high cost of college courses, how can states, districts and schools ensure that students get early access to high-quality, college credit-bearing coursework at a sustainable cost? This session explores how states, districts and organizations are “hacking” college access and affordability to increase student success. What can we learn from schools that successfully innovate and implement change? From a district that prioritizes personalized learning to a school known for its coding and computer science program and an academy that uses labor market data to inform its career offerings, this session showcases forward-thinking school leaders and their stories of innovation. While many states have policies in place to support innovation, these on-the-ground leaders communicated a vision for better serving students, secured support of local communities and executed their plans to make innovation a reality! One of the most challenging barriers to expanding public charter schools is access to quality facilities. To address this, states have instituted a variety of policies and programs, such as direct funding, access to free facilities and affordable financing. This session will explore how states can best combine these tools to ensure charter school supply meets family demand. “The rubber has met the road” for states implementing the Every Student Succeeds Act. After identifying their lowest performing schools, states now must undertake the most difficult – and most important – task of all: school turnaround. In this session, learn how states can catalyze meaningful change for their students in low-performing schools by deploying federal funding, leveraging educational opportunity and promoting high-quality instructional resources and effective vetting practices. An important mechanism for education choice is open enrollment, enabling students to attend public schools beyond where they are residentially assigned. This session explores where open enrollment is in place, the differences between policies across states and how (or if) states are tracking open enrollment trends. Panelists will discuss the triumphs and challenges of this policy while offering concrete recommendations on how to design effective open enrollment systems focused on the needs of families. Across the nation, policy changes and new initiatives this year are significantly impacting private education choice. State lawmakers, for example, have looked to create new options for bullied students as well as for working-class students, who are losing access to private education. At the federal level, passage of tax reform has led to impacts—some expected, some unexpected—on resources for private education. This timely session provides an overview of major changes in 2018 as well as a look at what’s next for educational opportunity in 2019. Keep an eye on our #EIE18 Agenda in the coming weeks for additional details on panelists and sessions. I hope to see you in Washington, D.C., in December! Lizzette serves as Vice President of Policy for ExcelinEd, bringing almost three decades of policy and legislative experience at both the state and federal level to the organization. In her home state of Texas, Lizzette served as deputy legislative director for then-Gov. George W. Bush and most recently as Chief Deputy Commissioner for the Texas Education Agency. Under Secretary of Education Rod Paige, Lizzette served as Special Assistant in the Office of Legislation and Congressional Affairs, where she guided the reauthorizations of IDEA and Head Start. She also served as the Secretary’s Regional Representative under Secretary Margaret Spellings. Her career reflects deep experience in education policy development and implementation as well as the “how-to” of legislative work needed to advance education reforms. Among her numerous appointments, Lizzette currently sits on the board of the KnowledgeWorks Foundation, the Austin advisory board of IDEA Public Schools and the advisory board of UTeach. She received her undergraduate degree from Southwestern University.